AIR CANDA is an instrumental four-piece band from Saint-Petersburg who describe their music as “new wave of prog-fusion, or post-jazz-rock”. It was formed in 2009 by Andrei Belka (bass), Stepan Zhzhyonov (guitar), Alexander Belousov (tenor saxophone) and Roman Oboskalov (drums), and made a memorable appearance at the 17th annual SKIF festival in SPb in May 2013. The band drew inspiration from the 70’s British jazz-rock and prog-rock, avant-garde jazz, classical music, modern American experimental rock, and Japanese math-rock to create intricate, dynamic, and elastic instrumental music of their own. Find AIR CANDA on VK.COM. 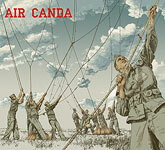 The debut self-titled album by the instrumental combo AIR CANDA. It was finished in late December 2013 but not released on physical discs until 2014 when the band signed with RAIG. 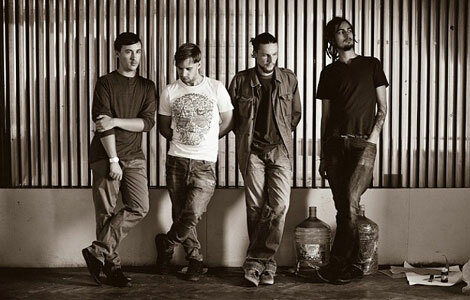 Recommended for lovers of well composed, complex, lively and eclectic prog-rock-fusion music. (8 tracks – 54 min.). Free streaming or immediate digital download of the album (MP3, FLAC or other formats) is available through Official R.A.I.G. Bandcamp. "Hard to pin down stylistically, as the band does draw it's sound from a few different genres, the music contained here could best be described as being prog rock in nature, but with a certain jazz and avant-garde slant as well. While the basis for the band's attack is primarily driven and centered on the muscular riffing and intricate playing of guitarist Stepan Zhzhyonov and the equally as formidable presence of Alexander Belousov's scorching sax work, what is equally impressive is the fluid and often funky rhythm section laid down by bassist Andrei Belka and drummer Roman Oboskalov. Taken together these four musicians interact with each other so well within the context of each composition, that ultimately you realize their intentions are not to show off their dazzling array of musical chops, but rather to serve the song first and foremost. The playing is tight and vibrant and coalesces perfectly, bringing out the densely layered textures and multi-faceted arrangements in all their sonic splendor. (Score: 4 of 5)" – by Ryan Sparks at Sea Of Tranquility (USA) (February 2015). "Russian band Air Canda's self-titled instrumental debut is crammed full of lively rhythms and multi-faceted tunes. Air Canda is an exuberant album, which often surprises and seldom fails to excite. Air Canda are a four piece ensemble, and on the face of it, their music is in some way influenced by the UK jazz-rock movement of the 70s. Comparison with Ian Carr's Nucleus readily springs to mind. At other times, the rasping saxophone, insistent rhythms and mouth-watering combination of improvisation, jazz, psychedelia and funk, accompanied by plentiful amounts of guitar is redolent of UK band Lapis Lazuli. The breadth and depth of what is on offer amounts to so much more than jazz or fusion, or indeed jazz-rock. The eight compositions sprawl energetically across a variety of genres and influences... The skill and energy of the musicians is perfectly portrayed in a release that has an abundance of exhilarating moments. The collective ability of the band and their empathy with each other is totally apparent, and is at the heart of Air Canda's successful sound. The band has perfected the art of creating a hugely expansive band sound that is complemented and cleverly embellished by many outstanding solos. The result is a compelling album that is inundated with unpredictable textures and complex rhythms. If you enjoy challenging music, flavoured by jazz, that excites and leaps effortlessly across genres, then I thoroughly recommend that you seek out this intoxicating album. (Conclusion: 8.5 out of 10)" – by Owen Davies at DPRP (UK) (May 2015). "Air Canda is a St Petersburg band crossing jazz and rock in an interesting way - the flavor of rock that they use is math rock, with twisty arrangements full of odd meters and abrupt changes, and their jazz is of the noisy modern variety. Some references might be Raoul Bjšrkenheim, Panzerballett, and Uz Jsme Doma; think of Ahleuchatistas (back when it was a trio) with a sax added, and youÕll be in the ballpark. Unlike many bands playing music this tricky, they manage to groove on their irregular rhythms, and they have a sense of fun as well, doing things like throwing a tango section into the middle of 'Fata Morgana'... On the whole, this is an outstanding release, well worth the attention of fans of the kind of jazz you find on Cuneiform, Moonjune, or RareNoise." – by Jon Davis at Expose (USA) (August 2016). More reviews: Musikreviews.de (Germany), Babyblauen Seiten (Germany), New Underground Music (The Netherlands), InRock (Russia), iO Pages (¹126) (The Netherlands).